Mints are aromatic herbs, which are warm, fresh and has sweet flavor with a cool aftertaste. They are used in teas, beverages, jellies , syrups, candies and ice creams. Mints are originally used as medicinal herb to treat stomach ache and chest pains. Mint leave are used in various cuisines too. Specially in India, they are used in making chutney's, added to non vegetarian dishes and also in the most popular biryani for the extra flavor. 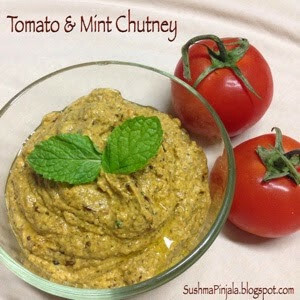 Mint and tomato is a great combination so for today am here with a flavorful chutney which is made with fresh mint leaves and tomatoes. Heat oil and add chopped brinjal, green chili, garlic cloves and onions. Cover with lid and cook for 10 minutes or until brinjal becomes soft. The Tomatillo, also known as Mexican husk tomato, is a plant of nightshade family bearing small and green fruit of the same name. A staple of Mexican Cuisine, they are eaten raw or cooked in a variety of dishes, particularly Salsa. Tomatillos have a high pectin content. They are the key ingredient in fresh and cooked Mexican and Central American Green sauces. Heat non stick pan and add chopped Tomatillo's, onions and green chilies. Cook for 10-12 minutes until Tomatillo's become soft. Now blend the cooked veggies along with cilantro. Serve as a dip with tortilla chips. Chapati Noodles sounds interesting right, saw this recipe on one of the TV Show. Its a great alternative to the left over chapatis / rotis. and perfect for lunch, brunch, dinner or for an evening snack too. Quick and simple dish to pack for school and office lunch box too. Kulcha is a type of leavened bread originated from Indian Subcontinent. Usually prepared with maida / all purpose flour. Kulcha is popular in India and Pakistan and is served with chole.It is typically a Punjabi recipe. Dough is rolled into flat round shaped and baked in a clay oven until golden brown. When baked, kulcha is rubbed with butter / ghee and then served with hot and spicy Chole / Chickpea curry. In Punjab and Some party of Pakistan Kulcha are very popular as a breakfast dish. Wash thoroughly and chop the dill leaves. In a wok or pan heat oil and add whole garam masala and cashew nuts. Saute for few seconds and add sliced onions. Today's smoothie is one of my favorite smoothie. Add all the berries, banana and milk, blend and serve. That's it your healthy and simple breakfast smoothie is ready with in 2 minutes. I have used frozen berries here, you can even use fresh berries. In a blender add banana chunks and all frozen berries. Also add milk and honey. Check to see what my fellow bloggers are cooking for BM 72. Theme: So many smoothies, so little time. Soak oats in 1/4 cup hot water for 10 minutes. Now add all the ingredients into blender. This creamy and refreshing smoothie is great for breakfast, after school snack or a mid day snack. I have used low fat vanilla flavored yogurt, you can as well use full fat if serving for kids, or just plain yogurt. My husband usually has smoothies or milkshakes for breakfast. I usually mix up berries and banana, apple and banana or just banana. Tried unique combination of orange and banana this morning and the smoothie tasted yummy. Add all the ingredients into blender. Schezwan is style of Chinese cooking which is spicy, oily and especially peppery. Schezwan sauce is used in preparing Schezwan fried rice, Schezwan noodles and many other Chinese dishes. This sauce is serves as a condiment for spring rolls, Manchurian or with any other appetizers. Remove the stems and soak red chilies in hot water for 30 minutes. Drain water and transfer the chilies to blender. Spring rolls are a large variety of filled and rolled appetizers found in East Asian and Southeast Asian Cuisine. The name is a translation of the Chinese Chun Juan which means spring rolls. The kind of wrappers / sheets , filling and cooking technique used or the name vary depending on the regions culture. It is believed that spring rolls originated from China. It was a seasonal food consumed during Spring, started as a pancake filled with the new season's spring vegetables, a welcome change from the preserved food of the long winter months. The Chinese spring rolls ate savory rolls filled with cabbage and other vegetables, wrapped cylinder shaped thin pastry. They are usually eaten during the Spring festival in China. Meat is also added according to the preferences. This Chinese corn soup is a perfect and comfort food to have it on a chilly day. A quick and easy soup made within 15 minute. This soup taste just like the one you order in Chinese or Indo- Chinese Restaurants. It is a very healthy and nutritious soup made with eggs, corn and vegetable or chicken stock. In a sauce pan combine vegetable / chicken stock and corn kernels, bring it to boil. In a separate bowl mix water and corn starch . Reduce the heat and add the corn starch tot he stock and continue to cook for about 2- 3 minutes or until the mixture thickens. Slowly add the beaten eggs while stirring the soup.